This is an engaging, well written and seemingly well-researched text which provides a detailed history of the existence and development of genocide and massacres. What I will not present in this review is a laborious overview of individual chapters. Rather, what I intend to provide are my overall reflections on the themes of the text and its potential contribution to the academic research base. One of the core issues that struck me about this text was its harrowing content, a content empathically acknowledged by Dutton who provides a personal reflection in the foreword of the impact that compiling this book had on him. Dutton warns the reader regarding the content although my concern would be that such a warning may be missed, particularly by the reader who makes the mistake of not commencing the book at the start but instead selects chapters at random. I would warn against this on two grounds: First this is a text whose narrative is only truly understood and appreciated by commencement at the beginning of the book with readers working their way through (I made the mistake of selecting chapters to review before I realised this); Second, the content is harrowing. I speak here as someone who works with high risk sexual and violent offenders and I am regularly faced with disturbing and emotive accounts of aggression and victim distress. Nonetheless, this did not prepare me for the book’s contents. I think what is most harrowing is its real nature (see in particular Chapter 5 and the massacres in Nanking, My Lai, El Mozote and Sand Creek; and Chapter 6 on Lynchings). Dutton makes no effort to write journalistically or to glorify the detail, rather basic facts are reported. This symbolises, I feel, the cold aspect of human nature and the behaviours that we can engage in when our individual personality becomes merged with a ‘nameless’ whole, e.g., an army, or a ‘cause’. 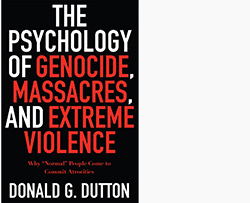 Dutton makes the interesting point that the text can be part-argument for the development of a new discipline – forensic ethology – the study of genocide and mass atrocities across history. This I feel is a valuable comment to make, with the text serving to highlight both the lack of research into this area of study (particularly from core aggression researchers), and the international nature of extreme group violence. The violence evidenced is not something specific to any one group, culture, or country. Connected to this, I felt Dutton only touched upon the true extent of atrocities (speaking as a British citizen I did note the absence of our own atrocities such as the ‘Witch Hunts’ of early Britain), although this in itself speaks volumes in that one book, comprehensive as it may be, no doubt could not document all of the atrocities committed by mankind. Dutton describes the text as a “marriage between psychology and history”. I would argue that the history element of this text is clearer than the psychology aspect, particularly in the first seven chapters of the text. This is not to criticise but merely to make the point that it is perhaps an area of study which psychology (among other related disciplines) has yet to examine in detail. The text did read more as an engaging account of historical development that was informed by some psychological principles. Reference is made to psychological concepts such as ‘in-group’, ‘out-group’, groupthink, obedience, minimization, denial, de-individuation, and dehumanisation (with increasing reference by Chapter 8 on ‘Societal Transitions: The Normative Shifts in Genocide’ and Chapter 9 ‘Individual Transitions to Extreme Violence’), but these are spread throughout the text and somewhat overwhelmed by the historical narrative. With regards to the historical content, the focus in the first chapter on the development of ‘positive violence’ in the form of ‘Holy War’ in the 12th Century provided an interesting account of how group violence was perhaps first rationalised. The parallels between medieval and modern times concerning the beliefs rationalising the use of mass violence (notably religious beliefs and the spiritual and community rewards for those engaging in ‘just’ war) and the atrocities actually evident (which now would be referred to as war crimes), is startling. It would seem to suggest that there is something very predictable about human behaviour regardless of the passing of time. Clearly, predictable behaviours lend themselves well to academic study: if anything what struck me about this text was its highlighting of how valuable studying such behaviour within an academic discipline would be. This was further highlighted in the ensuring chapters which outlined how violent cultures are more the norm in human society rather than the exception; rather it just appears that our recording of such behaviours has improved, perhaps a result only of technological advancement (e.g., cameras, video, etc). The relatively new recording of such atrocities is illustrated further by Dutton in his description of the only recent development of terms to describe it – genocide and democide (Government sanctioned killing of over 1 million people as part of a political threat). Dutton makes the point that the 20th Century “may become historically infamous for identifying new and sinister types of aggression”, but this does not mean that such aggression did not occur prior to the 20th Century, just that we appear only recently interested in its documentation and study, and in beginning to accept that such behaviours take place. Overall, I would certainly recommend this book although with a warning as to its distressing content. I think it is an exceptionally well written text which highlights an area of study which aggression and forensic researchers should take more interest in to understand both what promotes mass violence and what protects against it. I think Dutton has produced a book on this topic worthy of accolade, if not simply for highlighting the importance of these issues and for presenting a detailed outline of how such atrocities have presented across the medieval and modern world. I hope that the text serves to stimulate empirical research into this important area of emerging study, and would encourage the disciplines of forensic psychology, sociology, and anthropology in particular to take an interest. Ashworth High Secure Hospital, Liverpool, UK. Ireland, J. L. (2007). Book Reviews: Dr. Don Dutton. The Psychology of Genocide, Massacres and Extreme Violence: How Normal People Commit Atrocities. ISRA: The Bulletin of the International Society for Research on Aggression (Vol. 29, pp. 18-19).